"Separated from his brother Scott — who would eventually grow into the mutant Cyclops — and cut off from his own powers by Mr. Sinister, Alex Summers grew up ignorant of his mutant heritage. As a result, he wasn’t trained in the use of his powers until late in life. He has since overcome that obstacle and turned into a powerful hero in his own right, leading a team of mutant adventurers into deep space against the insane despot Vulcan." For the seventeenth, and I do believe final, entry in this year's roundup of post-Christmas reviews, I'm touching on one of the little quirks of my collecting habits: owning every figure of certain characters. There are just some characters that really resonate with me, and are minor enough that owning all of their figures is actually a totally attainable thing*. One of those characters is my favorite member of the X-Men, Alex Summers, also known as Havok! 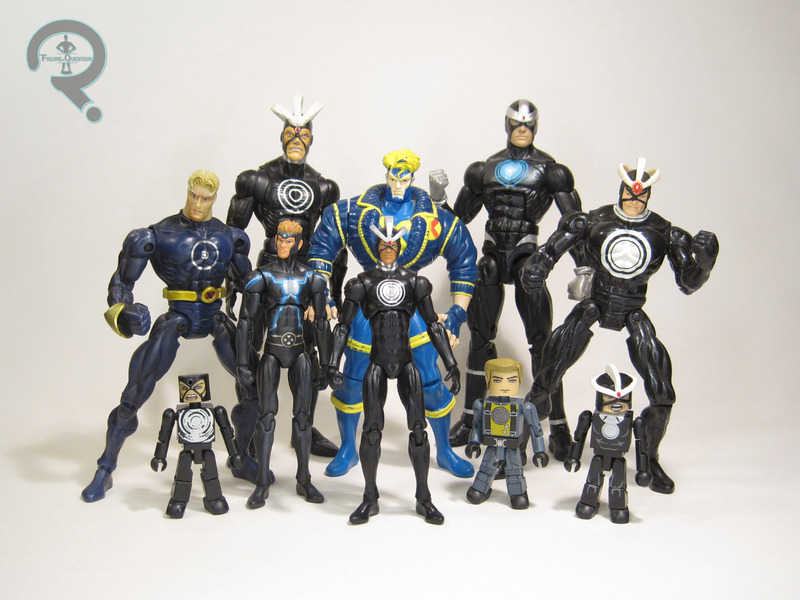 Havok was released in Wave 8 of Hasbro's Marvel Universe line, which was the third assortment of the line's second year. He was numbered 018, following the relaunched numbering stucture of 2010, and was also one of the five Fan's Choice figures released in the line that year. There were two different versions of Havok to be had. The regular release was his then-current costume, while the variant release, which I'm looking at here, was his classic gear. The figure stands 4 inches tall and has 22 points of articulation. 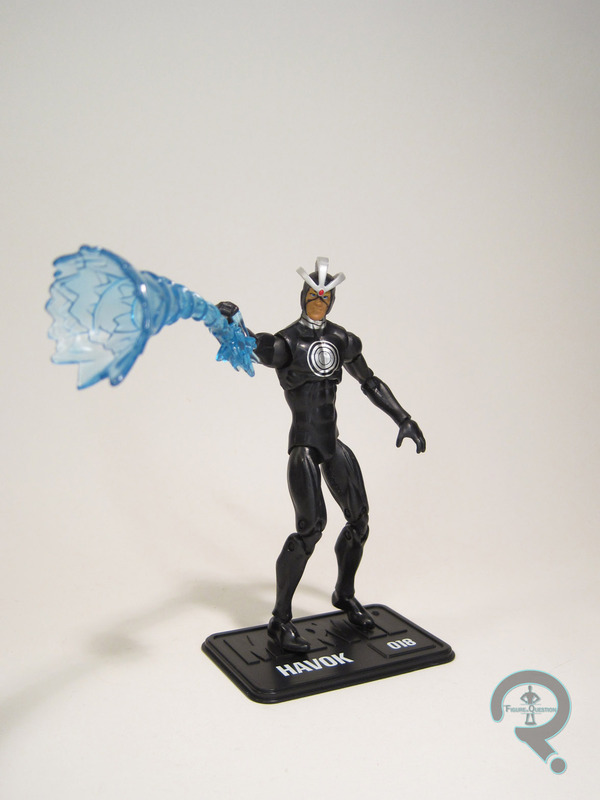 Havok made use of the body originally used for Black-Costumed Spidey, one of Hasbro's favorite bodies from this line. It was one of the better bodies from the line's debut year, but it was still a little wonky. It feels a bit like the antithesis of the body Moon Knight was on; this figure seems to have gained the segment of torso length that was missing from the former. Also, the very skinny nature of this figure's legs had a tendency to give him some stability issues. A later variant of this body added swivel joints to his thighs to aid somewhat, but no such luck this early into the line. Havok sports a brand new head sculpt, which is definitely the highlight of the figure. Early MU sculpts weren't the most detailed, but Havok's actually looks pretty decent, and I certainly applaud their choice not to go with a screaming look, while still giving him that proper Alex Summers pout. His distinctive headgear is actually a separate piece, and it's not held in place by anything more than some rather shallow pegs, meaning it's a little on the floppy side. I found that a small touch of super glue was needed to keep the figure from being too frustrating. I'm not entirely sure why it wasn't just glued down in the first place, but there you have it. Havok's paintwork is rather on the simple side, but the application is all pretty clean, and his design looks just as striking as it should. Havok was packed with an energy effect piece (borrowed from the prior year's classic Iron Man), as well as a display stand with his name and number on it. This figure is the last Havok figure I didn't own, and he's kind of been my white whale for a little while. I mean, not in a crazy, ranting and raving, risk my life to get him sort of a way, but more a "always be the one that got away" sort of a way. I grabbed the standard Havok when he was new, and I knew this guy was supposed to be showing up in revision cases, but I never once saw him. Then the line was done, and he was going for some crazy high prices for a while, and I just sort of gave up and accepted my little Havok collection as incomplete. Of course, my parents, who got me into this whole Havok-collecting thing in the first place, weren't going to stand for any of that nonsense, and so this guy was among my presents this past Christmas. Is he the greatest Havok figure ever? Nah, but I do sure like him a lot, and I'm happy to have the whole group together! *To date, I've attained this with three characters of note. Havok, of course, as this review indicates, as well as Wonder Man and Elongated Man. You are subscribed to email updates from The Figure In Question.